I actually have two: chick lit and true crime. The first because I can't stand shoe shopping and don't want to read about other people doing it, the second because there's enough bad stuff on the news everyday without reading more. 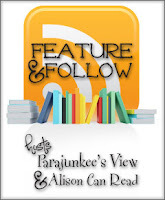 I am always inspired by our kind hosts, Parajunkee and Alison Can Read for their dedication to their blogs. Also, I have great respect for any writer who blogs as I know from personal experience how hard it is to find time for one, let alone both. Ha ha, the shoe shopping comment made me laugh ;) Great answer! LOL - great answer. I don't read much chick lit or true crime, but I won't rule either out entirely. As long as the story's intriguing, I'll try a book in any genre except erotica. Hi -- you linked just below me in the Book Blogger Hop, so I thought I'd see what genres you dislike. I agree with you on true crime. I didn't think of separating those out from all the other non-fiction that I don't enjoy. I'm going to poke around and take a look at your other entries -- and the list of books you've read this year. Great answers!! Thanx for visiting my FF! !